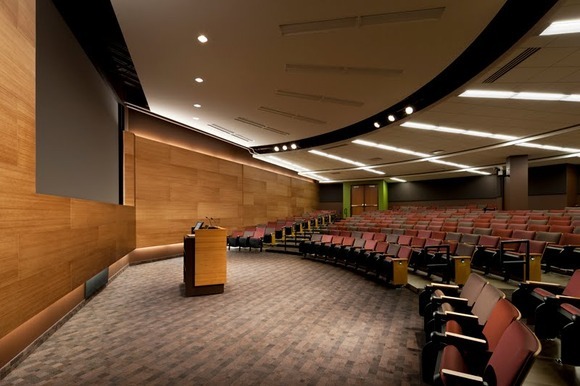 SALT LAKE CITY, Utah — One of the world’s major producers and marketers of food, agricultural, financial and industrial products and services, recently completed a large auditorium for its Minnetonka, Minnesota corporate offices that includes a sophisticated audio/video system based around HARMAN’s BSS Audio Soundweb London networked signal processors. The system was installed by AVI Sytems of Eden Prairie, MN, a systems integrator that specializes in professional A/V installations for business, commercial, educational and government clients. Peterson pointed out some unique challenges when designing the installation: “The BSS Audio components needed to interface with the control system for volume and routing, as well as for multiple preset recalls. In addition, the system needed to operate in both automatic mixer mode as well as a full-manual control system. For more information about AVI Systems, please visit www.avisystems.com.